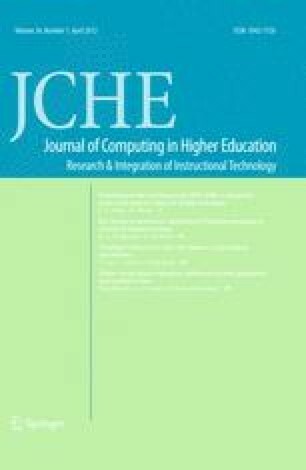 This study investigated the longitudinal trends of academic articles in Mobile Learning (ML) using text mining techniques. One hundred and nineteen (119) refereed journal articles and proceedings papers from the SCI/SSCI database were retrieved and analyzed. The taxonomies of ML publications were grouped into twelve clusters (topics) and four domains, based on abstract analysis using text mining. Results include basic bibliometric statistics, trends in frequency of each topic over time, predominance in each topic by country, and preferences for each topic by journal. Key findings include the following: (a) ML articles increased from 8 in 2003 to 36 in 2008; (b) the most popular domain in current ML is Effectiveness, Evaluation, and Personalized Systems; (c) Taiwan is most prolific in five of the twelve ML clusters; (d) ML research is at the Early Adopters stage; and (e) studies in strategies and framework will likely produce a bigger share of publication in the field of ML. Attewell, J. (2005). Mobile technologies and learning: A technology update and m-learning project summary. London, UK: Learning and Skills Development Agency. Retrieved from http://www.m-learning.org/docs/The%20m-learning%20project%20-%20technology%20update%20and%20project%20summary.pdf. Executive Yuan of the Republic of China. (2005). National Science and Technology Program for e-learning [website]. Retrieved from http://elnpweb.ncu.edu.tw/old/english/english1.htm. Geddes, S. (2004). Mobile learning in the 21st century: Benefit for learners. Knowledge Tree e-journal. Retrieved from https://olt.qut.edu.au/udf/OLTCONFERENCEPAPERS/gen/static/papers/Cobcroft_OLT2006_paper.pdf. Hung, J. L. (2010). Trends of e-learning research from 2000–2008: use of text mining and bibliometrics. British Journal of Educational Technology. Retrieved from http://onlinelibrary.wiley.com/journal/10.1111/%28ISSN%291467-8535/earlyview. Motlik, S. (2008). Mobile learning in developing nations. International Review of Research in Open and Distance Learning, 9(2). Retrieved from http://www.irrodl.org/index.php/irrodl/article/view/564/1071. Polsson, K. (2009). Chronology of handheld computers. Retrieved from http://www.islandnet.com/~kpolsson/handheld/.